The night sky, both beautiful and mysterious, has been the subject of campfire stories, ancient myths and awe for as long as there have been people. A desire to comprehend the Universe may well be humanity's oldest shared intellectual experience. Yet only recently have we truly begun to grasp our place in the vast cosmos. To learn about this journey of celestial discovery, from the theories of the ancient Greek astronomers to today's grandest telescopes, we invite you to experience From Earth to the Universe. Directed by the young Greek filmmaker Theofanis N. Matsopoulos, and featuring a sweeping soundtrack from Norwegian composer Johan B. Monell, viewers can revel in the splendour of the various worlds in the Solar System and the ferocity of the scorching Sun. From Earth to the Universe then leaves our home to take the audience out to the colourful birthplaces and burial grounds of stars, and still further out, beyond the Milky Way, to the unimaginable immensity of a myriad galaxies. Along the way, the audience will learn about the history of astronomy, the invention of the telescope, and today's giant telescopes that allow us continue to probe ever deeper into the Universe. 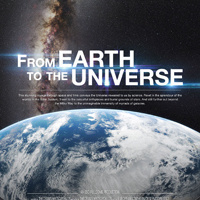 Director Theofanis N. Matsopoulos described the film as a colourful and inspiring journey; the visuals are stunning and really speak for themselves in showing just how far humanity's ambition has taken us in terms of observing and understanding the Universe.